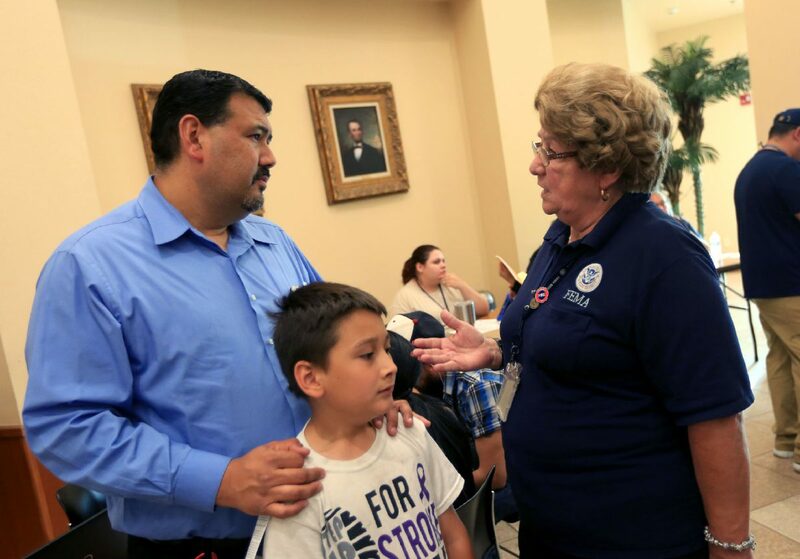 FEMA Disaster Survivor Assistance Specialist Ester Herrera, right, talks with Fred Garcia and his son Matthew Garcia, 9, about their flooded home during a flood recovery forum Wednesday, July 11, 2018, at Weslaco City Hall. Garcia said his family live near FM 1015 and 9 Mile and hopes his entire neighborhood is bought out and demolished because it floods frequently. 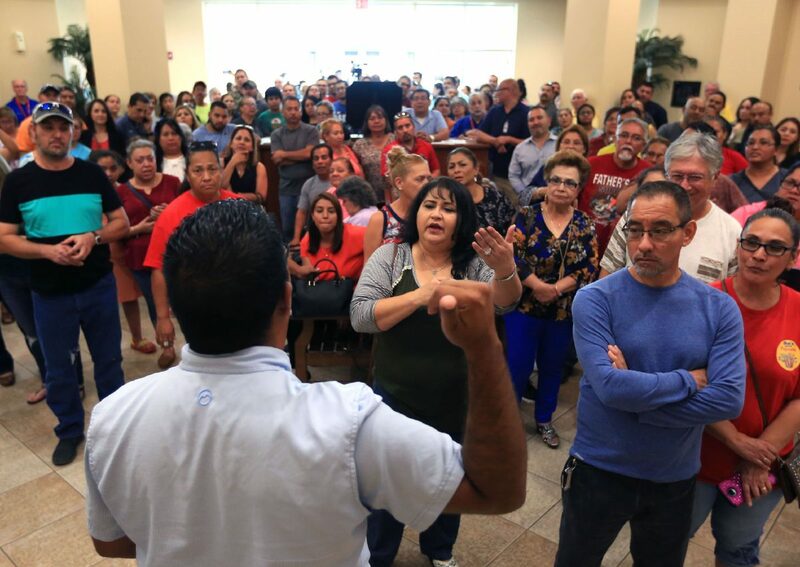 WESLACO — A few hundred residents showed up to the first flood forum Wednesday, many of them placing the blame on city administration and commissioners for lack of flood controls, which left about 20 percent of the city under water last month due to relentless thunderstorms and showers. 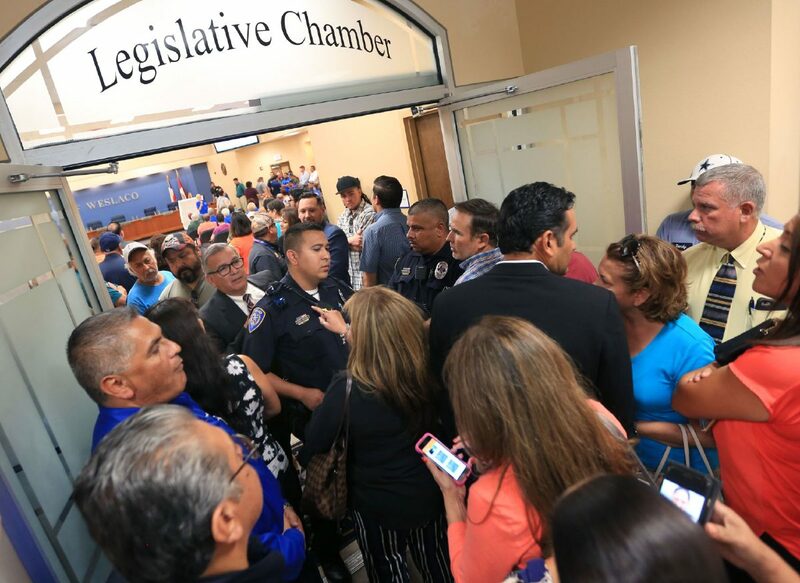 Residents unable to fit into the legislative chamber, which was at max capacity, crowded the lobby area, where they heard from city, county and federal representatives, many of whom explained that the infrastructure in place worked as designed. Reyna Conde, 23, told commissioners and officials that she is the sole caretaker of her 68- and 72-year-old parents, whose house flooded last month. “I regret moving to the city of Weslaco,” Conde said, explaining that she previously lived in California. Letty Aleman, behind center, reacts after Alex Livas, front, told the crowd that the public comment section of a flood recovery forum would not be heard over the loud speaker in an overflow area Wednesday, July 11, 2018, at Weslaco City Hall. The audio was put back on after many from the crowd insisted it resume. Weslaco City Manager Mike Perez, behind left, stands behind police officer Roberto Rodriguez as people try to gain access to the meeting chambers for the public comment section of a flood recovery forum Wednesday, July 11, 2018, at Weslaco City Hall. The crowd for the forum filed the chamber and atrium area at city hall. 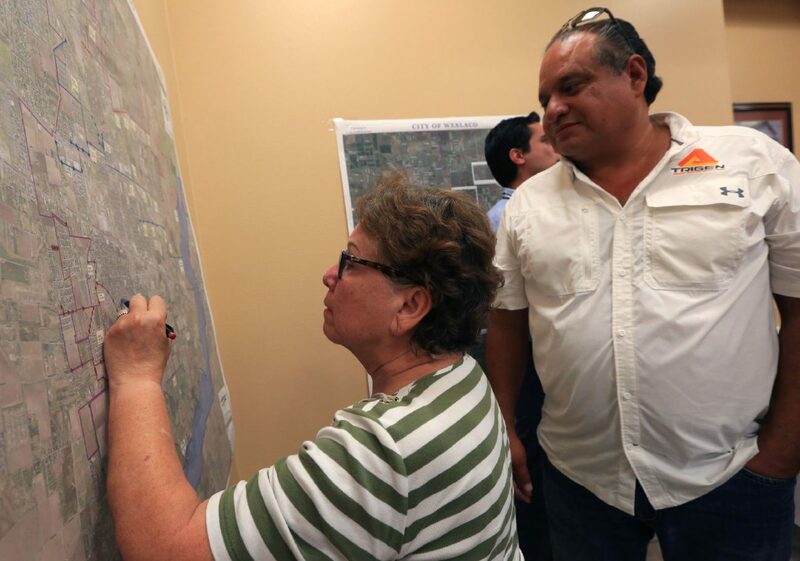 Edna de la Rosa marks her neighborhood on a map after officials asked citizens to point out where they are having problems with flooding as Vidal Zamora watches during a recovery forum Wednesday, July 11, 2018, at Weslaco City Hall. De la Rosa said she has lived near Border and 13th Street for 41 years and never has seen it flood until the recent heavy rain event. Others told commissioners they’re considering leaving town because of the flood. “It is heartbreaking to watch all your stuff go under,” another resident said. A handful of those making public comments, which were limited to three minutes each, defended the city staff. “It’s not this leadership team here,” said James Martinez, adding that he is still considering selling his house to move to McAllen. Prior to the public comment portion of the forum, Barry Goldsmith with the National Weather Service, Emergency Manager Tony Lopez, Engineer Mardoqueo Hinojosa and David Fuentes detailed the response and preparation done prior to the massive rainfall in late-June. Pumps to remove water from roadways were in place by 9 a.m., and ditches were previously cleaned of debris, which facilitates the flow of water into the floodway, Lopez said. Now, the city is on the recovery phase of removing debris from 2,500 homes, which were impacted by the flood. Residents were visibly upset during the mention of floodgates, which allow for the control of water through the floodway. County and city officials have repeatedly mentioned that floodgates were opened as necessary before the area was flooded. Fuentes explained that voters may be considering a bond during the November election, which could allow for millions of dollars to be borrowed to improve drainage infrastructure. Taxes, he said, will not go up with a $50 million bond, but residents would see a one cent tax increase for a $120 million bond, which would be directed toward alleviating flooding during similar events. “We can go a lot further with one cent,” Fuentes said during the forum. Halff Associates, an engineering firm, will conduct a post-storm assessment, which will evaluate Hidalgo County Precinct 1, encompassing Weslaco. Residents made suggestions from the hiring of more public works employees to clean and maintain the drainage ditches to ignoring park improvements. The comments made at the forum will be considered by city commissioners, who will be looking at long-term solutions to improve drainage infrastructure.